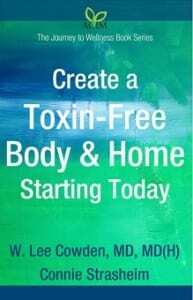 (Book review) “Create a Toxin-Free Body and Home Starting Today,” by Dr. Lee Cowden and Connie Strasheim. And then people start explaining: Dying spirochetes give off biotoxins in the blood stream, making your symptoms worsen. Though it’s technically known as a Jarisch-Herxheimer reaction, Lyme patients typically just call it “herxing.” Various methods can help “take out the trash.” Regular detoxing often helps the person feel better. However, a new book called “Create a Toxin-free Body and Home Starting Today,” says detoxing is not just for Lyme patients trying to stop herxing in its tracks. According to the authors, everybody—healthy or not—needs ways to protect themselves from the onslaught of environmental toxins which permeate our surroundings every day. Imagine your body is a bathtub with many faucets. Some bring in good stuff and some bring in bad stuff. There’s also a drain at the bottom of the tub. If too much bad stuff (pollution, pesticides, allergens, etc) go in, it can overwhelm the good stuff (pure water and food, fresh air, etc), and clog the drain in the process. The result? You’re stuck with a tub full of filth and no way to get rid of it. Having your body awash in dirty water is NOT the way to get or stay healthy. Part One of the book deals with creating a toxin-free body, discussing such topics as food, water, and assorted toxin removal strategies such as liver and gall bladder flushes, lymphatic drainage and saunas. Part Two involves creating a toxin-free home, covering subjects such as household cleaning products, carpeting, furniture, and mold. Some of suggestions are complex and expensive—perhaps replacing the flooring in your house with non-toxic alternatives. Other remedies are easy and cost nothing—such as removing your shoes before you enter the house. So keeping two pairs of shoes—one for outside, one for inside—and switching them at your door, can go a long ways towards reducing toxins in your home. « Previous Post So what does it take to get a good night’s sleep? Next Post » NEWS: Under Our Skin sequel "Emergence" is here! Thanks, Dorothy, for the informative book review and the small bite size bit of advice about not wearing our outside shoes in the house. It is amazing how unaware I was of the toxins in the environment before I got ill. If I knew, when I began, how complicated my recovery would be and how pervasive the hazards are which can drag me back down if I am not attentive I don’t know if I could have taken the challenge. We all continue to learn and do what we can when we can.